While you are sleeping, your brain will cycle through two different stages of sleep repeatedly: REM (rapid eye movement) sleep and non-REM (non-rapid eye movement) sleep. REM sleep is often associated with very vivid dreams while during the stage of non-REM sleep, our dreams tend to be more concept-based. So let’s first take a look at the definition of REM sleeps and how long it takes to get into REM sleeps. What is the REM Sleep? We enter REM sleeps in the first 90 minutes since the moment we fall asleep and, when the sleep cycle repeats during the night. This stage of sleep occurs several times every night and dominates the latter half of the sleep period. It is about 20 to 25 percent of an adult’s sleep cycle, and more than 50 percent of an infant’s one. It is believed that the REM sleep plays an important role in learning, memory, and mood. Moreover, most of our dreams occur during this stage. The first phase of REM typically lasts after 10 minutes, and its component of each sleep cycle usually increases when the night goes on. 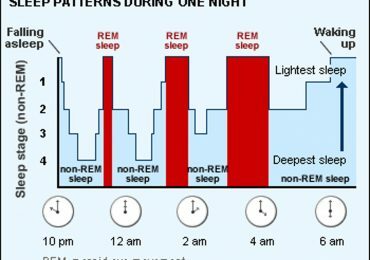 The final phase of REM sleeps may last for up to an hour. What Happens During REM Sleep? From the name of this stage, you can see the first obvious phenomenon happening during this time is that the rapid movement of the eyes. Secondly, breathing becomes more rapid and irregular during REM sleeps than during non-REM sleeps resulting in the increased oxygen consumption by the brain. Besides, the heart rate and blood pressure also increase to near waking levels. There would be some slight changes in body temperature because the core temperature is not regulated well during REM sleeps and tends towards the ambient temperature. Sexual arousal is also common during REM sleeps. So what about human muscles and brain? How do they work in this period? During the non-REM stage of sleep cycle, the muscles become more relaxed. But REM sleeps is also called as a state of temporary paralysis. This means, during this stage, the muscles are completely paralyzed because the brain signals the spinal cord to cease movement of the arms and legs. This lack of muscle tone is known as “atonia”. So why do our bodies have this such interesting phenomenon? 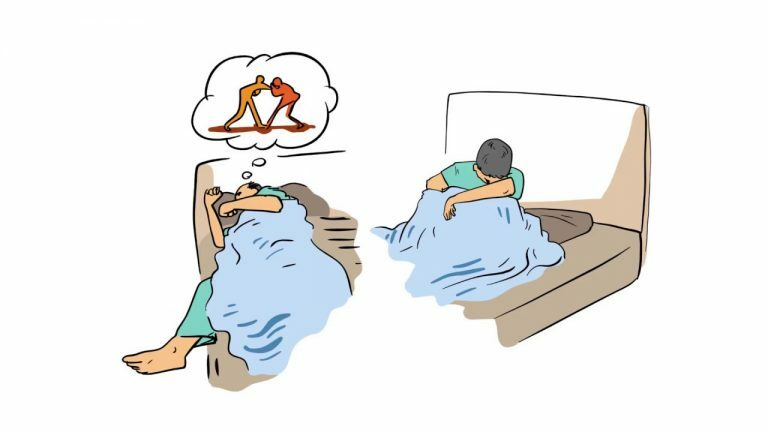 This paralysis during REM sleeps acts as a protective mechanism to avoid our bodies against injury that might be caused by acting out our dreams. REM sleeps is a stage when most of vivid dreams happen to us because the brain activities during this stage increase. Some scientists use the name “paradoxical sleep” to call the state of REM sleeps. Why? Because in the stage of sleep cycle, the muscles are paralyzed while the brain is very active. In fact, the oxygen consumption of the brain during this period is very high (also its energy consumption), and it is actually much higher than it is when you are awake and working on a complex problem. Read more: What is the best pillow for side sleepers? Why is REM sleep so important? REM sleep is considered as the peak of protein synthesis at the cellular level, which keeps many processes in the body working properly. In addition to being associated with dreams, REM sleep appears to provide a restorative function for both the brain and body. It also supports optimal daytime performance, both mentally and physically. It is believed that if people could not get into the stage of REM sleeps, they would find it difficult to memorize what they had learnt before falling asleep. But, of course, both of REM and non-REM sleep together play an important role in learning of memory. It is highly recommended for infants to get higher levels of REM sleeps every night because based on some research, scientists found out that this stage of sleep cycle plays a basic role in neural stimulation that is really essential for the development of mature neural connections. Sleep apnea is characterized by abnormal pauses in breathing or instances of shallow or infrequent breathing during sleep. Obstructive sleep apnea (OSA) is considered as the most common type of sleep apnea. Obstructive sleep apnea (OSA) and hypopneas is revealed to happen mainly during REM sleep with the help of polysomnography (PSG). Then sleep clinicians use the term “REM-related obstructive sleep apnea (OSA)” to describe this. While obstructive sleep apnea (OSA) is associated with overall cardiovascular disease and mortality, the association with atherosclerotic cardiovascular disease is less clear, especially in women. But recently, due to some research on OSA during REM-sleep, scientists started with the idea that OSA during REM sleeps has more severe adverse effects on the cardiovascular system than OSA does during non-REM stage of sleep cycle. So they came up with the idea that severe sleep apnea during REM sleeps is somehow related to early signs of atherosclerosis. Sleep apnea can occur during any stage of sleep, but it is believed to be the worst if it occurs during REM sleeps. Because of reduced muscle tone in the upper airway that naturally happen s during this period of sleep cycle. In fact, some people have to suffer from apnea disorder that only occurs during REM sleeps. In addition, new research recently suggests that sleep apnea might disrupt the formation of new spatial memories. They found that sleep apnea can impair spatial memory in humans even when other sleep stages are intact. Overweight: There are some research showing that short sleep times and reduced REM sleep period would result in excess weight in children and adolescents. What does REM sleep behavior disorder (RBD) mean? REM sleep behavior disorder is a neurologically based sleep disorder in which people get into the REM stage of sleep cycle, but the signals in the brain which usually generate muscular paralysis are not blocked by a “gateway” in the brainstem provided for this purpose during REM. Or for easy to understand, we can say it is a condition where the muscle paralysis that normally occurs during REM sleep is incomplete or absent. This causes dreamers to act out their vivid dreams. REM sleep behavior disorder is considered as a dangerous form of sleep disorder because it can not only harm the people engaged in the acting out of their dreams, but also anyone else who is in the same place with them. Patients that are suffering from REM sleep behavior disorder (RBD), instead of experiencing the normal temporary muscles paralysis of arms and legs (atonia), they would physically act out their vivid dreams. The onset can be gradual or sudden, and periods might happen several times per night. This sleep disorder could become worse with time. Dream-enacting behaviors include kicking, talking, yelling, punching, siting, jumping from bed, grabbing and flailing their arms around. Noises, such as talking, laughing, shouting, emotional outcries or even cursing. You could recall the dream if you are awaken during the period. In human brain, during REM sleep, nerve pathways that prevent muscles from moving are active, resulting in the temporary muscles paralysis of your body. In REM sleep behavior disorder, these nerve pathways do not work anymore and you may physically act out your vivid dreams. Being male and over 50 years old: Nowadays, more women are now being diagnosed with the REM sleep behavior disorder, especially under the age of 50. Moreover, young adults and children can also develop this sleep disorder, usually in association with narcolepsy, antidepressant use or brain tumors. Taking certain medications: Some newer types of antidepressants. The use or withdrawal of drugs or alcohol. Having a neurodegenerative disorder, such as Parkinson’s diseaseor Lewy body dementia. Having narcolepsy: A chronic sleep disorder characterized by excessive daytime drowsiness and hallucinations. There are those who believe that there might be other specific environmental or personal risk factors for REM sleep behavior disorder (RBD), such as occupational pesticide exposure, farming, smoking or a previous head injury. Affect the patients’ sleeping partners or other people living in the same place with them. Patients tend to isolate themselves from the society because they are afraid that the other might know about their sleep disruption. Patients suffering from RBD might injure themselves or their sleeping partners. How can we increase the REM sleep stage? Go to bed 30 minutes earlier. We have 90-minute sleep cycles and the REM period usually occurs earlier in the morning. If you have to wake up early, you might not have enough time to hit the REM stage of sleep cycle before your alarm goes off. So try to prolong your REM sleep by adding an extra 30 minutes of sleep. Adjust your bedtime so you go to sleep 30 minutes earlier than usual and then keep this adjustment for your sleep schedule by doing it every night. Maintain a regular bedtime routine. You should make a sleep schedule at which time you will wake up and go to sleep at the same time everyday, even on weekends or days off. Each person has different sleep requirements, but on average, you should have between seven and nine hours of sleep a night. Having a regular sleep schedule will help increase REM sleep and the overall quality of your sleep. Shut off your smartphone, tablet and computer before going to sleep. The type of light these screens emit can stimulate your brain, suppress the production of melatonin (which encourages REM sleep), and interfere with the internal clock of your body. Once you are in bed, stay off your devices, relax, focus on your breathing, and if you are feeling up to it, try meditating. Be aware of what you eat (and drink). Caffeine could suppress your REM sleep. Coffee, chocolate, soft drinks, non-herbal teas, diet drugs, and some pain relievers consist of caffeine. You should limit the amount of coffee you have several hours before bedtime, or it would be better if you can eliminate caffeine completely from your diet. In addition, alcohol could also prevent deep sleep and REM sleep. It would keep you in the lighter stages of sleep. Although it helps you fall asleep, it disrupts your typical sleep cycle and decreases the overall quality of your sleep. You properly could be awakened easily and have a harder time falling back asleep. So it is recommended to avoid consuming alcohol several hours before bedtime to improve your chances reaching the stage of REM sleep.